You’ve got your clear vision. You know what you want to do in medicine. You are connected to the impact you want to make in the world through the patients that you serve. Now what? How do you take this clarity and allow it to transform your life into something that you have always dreamed about? The next step to creating the life and medical career you desire is to breathe life into your clear vision. What does it take to make your clear vision come alive? As physicians we are so busy meeting the needs of our patients, our team, and our families that we take little time for ourselves. Yet to have the life we desire we must invest time in its creation, first in our minds, our thoughts, and our energy before it becomes our everyday reality. That is the beauty of the creating the clear vision. A clear vision allows physicians to quickly and easily reframe the stress, frustration, and overwhelm of managing a full practice or taking care of high acuity patients in the unit into the realm of possibilities. As you crafted your clear vision, what discoveries did you make? They really want to do something beyond clinical medicine but no one in their immediate network is doing what they dream of, so it seems farfetched. Rather than go off the beaten path, they struggle with fitting in. They make decisions, like saying yes to a position that is not in alignment with their clear vision, and then wonder why they feel so drained at the end of the day. The life and career they created is really someone else’s dream. Sure, they are successful in their field of medicine. They are rightfully proud of all they have accomplished as a doctor. They see how other people react when they tell them they are a doctor. But deep inside there is a yearning for more. Their inner thoughts and conversations are keeping them from their true self. They may have forgotten about their vision. Instead they hear the inner critic telling them that they don’t deserve success and happiness. Then they look for evidence in their life to support what that pesky inner critic is saying. Breathing life into your clear vision is the next step to creating it. Breathing life into your clear vision means allowing it be the focus of your attention. Every day spend 15 minutes writing out what you desire. Be as descriptive as possible. Describe the people you want to work with, the team you want to build, the ways that you support one another and communicate with each other for the highest good of the patients and each other. Imagine what your best day looks like and feels like. Then set the intention to experience it. Ready to breathe life into your vision? Let’s talk about what is really possible for you in medicine. 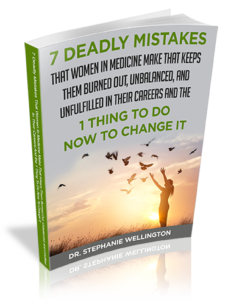 Email me at Stephanie@NurturingMDs.com to get started.